Ted Moore’s artwork will appear at the Cultural Engagement Center on the NOC Tonkawa campus through March 15. TONKAWA — The Cultural Engagement Center at Northern Oklahoma College Tonkawa is hosting an artist reception for Ted Moore on Feb. 14. The reception will showcase Moore’s artwork depicting Native American imagery in acrylic paint. The reception is in the CEC on Thursday, Feb. 14 from 12:30 to 1:30 p.m. Cookies and tea will be served at the reception. Moore considers himself to be a Native American artist based in Fairfax and the Grayhorse Pa-Su-Li community, who strongly upholds his Native traditions, not only through his artwork, but also through his longtime participation in the annual Osage Ceremonial Dances. Moore also upholds his Otoe-Missouria traditions and the Pawnee Kitkehaki Ceremonial dance. He is a member and adviser to the Osage Grayhorse District Dance Committee, and served as a tail dancer for more than a decade. He enjoys bringing together his artistic talents and respect for Native heritage in his paintings. Moore is employed with the Northern Oklahoma College in Tonkawa as the Native American Student Success Specialist. He manages the NOC Cultural Engagement Center in charge of sponsoring Native American cultural events/activities for NOC students and the community. Moore leads the mentoring services of Native students through the assistance of 10 Native Mentors/Coaches. The goal of the mentoring services is to assist NOC Native students to succeed and complete college. Moore’s past work experience includes helping to establish and then serving as Development Director for the statewide Native Arts Circle nonprofit agency in St. Paul and Minneapolis, Minnesota. 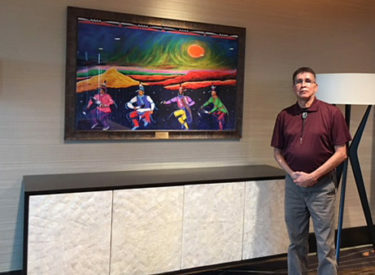 He also worked as the Lead Teacher for the St. Paul School District Indian Education program; and then served as the Art teacher and Curriculum Development Specialist at the World Cultures and American Indian Magnet School in St. Paul, Minnesota. He has a Master of Education (M.Ed. ), a Bachelor of Fine Arts Degree in Painting (BFA) and is a certified K-12 Art Education Teacher in the State of Oklahoma. The art exhibit will be on display through March 15. Cultural activities are part of NOC’s Native American Serving Non-Tribal Institute (NASNTI) grant entitled “Merging Tradition and Technology: Engaging Native American and Low Income Students to Complete College.” The project’s three initiatives are to expand access to high-demand, high-quality courses, develop and improve online services, and develop support for Native American student success.